The first thing I want to do is get to as many of you as fast as I can and this is the best way that I know how. Sister Marge and I will be out of the state from July 9 to August 1. Anyone wishing to contact us can do it by email. I have reviewed a little over half of the evaluation reports and I see some very good news. 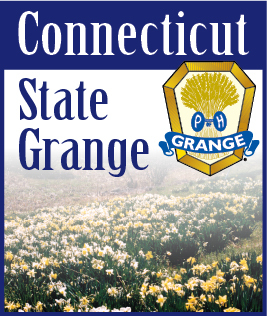 Over the past year fourteen Granges have taken in Fifty-seven new members. I am sure this number will increase as the rest of the reports come in. I am also sure it is due to the National Session being in Connecticut last year. What is great about this is that it shows that it is possible to bring in new members. Now that we know how we should continue to do it year after year and it should get easier as we go along. The down side of the reports is that too many of our Community Granges are still struggling. I hope that the work we have started can help some of them before it is too late. Even those that are struggling continue to do good things in their communities and this shows that there is hope for them. “Hope and Persevere”. Another part of the reports that I find troubling is that many Granges are operating at a deficit. I know that the cost of operating a successful Grange is going up. Do you need to have more fundraisers? Or maybe it is time to look at your dues structure. I have seen from the questionnaires that accompanied the reports that most Granges have already addressed this problem and by the time you read this most Granges will have received a letter from me with comments on their evaluation. This issue of the Granger will cover July and August so here are important dates for both. July 25 at Goodwill Grange Hall in Glastonbury will be “Let’s Celebrate”. You will see more about this inside the paper. Do your best to support it. The Northeast Lecturers Conference will be held August 3rd to 6th at Bridgewater State College, Bridgewater Massachusetts. Rhode Island will be the host state. Let’s give our State Lecturer, Marge, a good turnout. These will help you enjoy the summer.